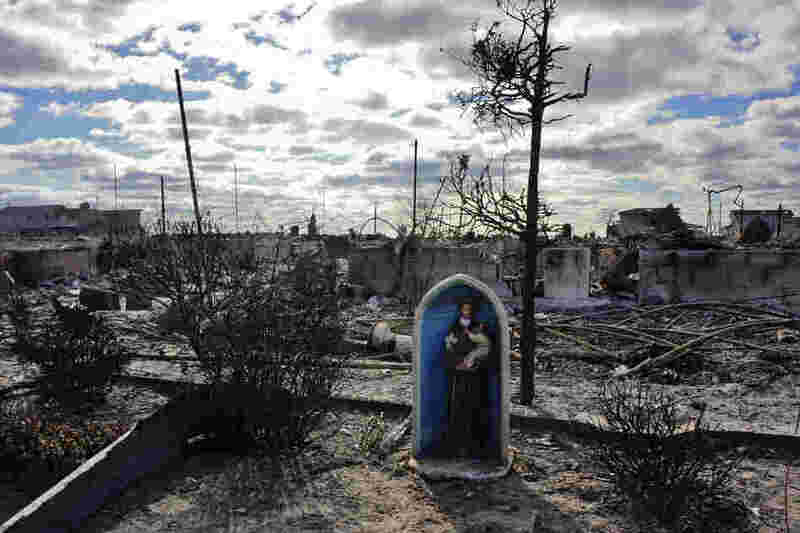 A chapel icon, that once adorned the front of a beachfront home, is one of the few items to have survived what is now known among local firefighters as "The Breezy Point Fire." 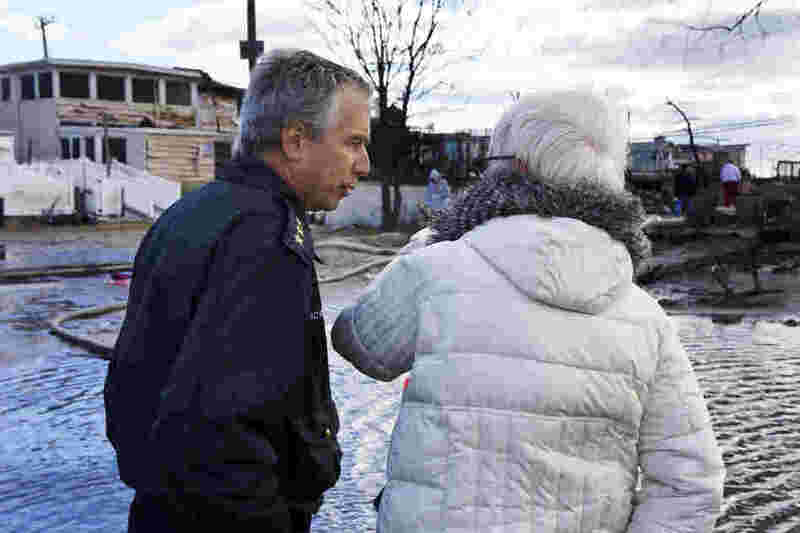 New York Fire Department Chief Joseph Pfeifer consoles a woman who lost her home. 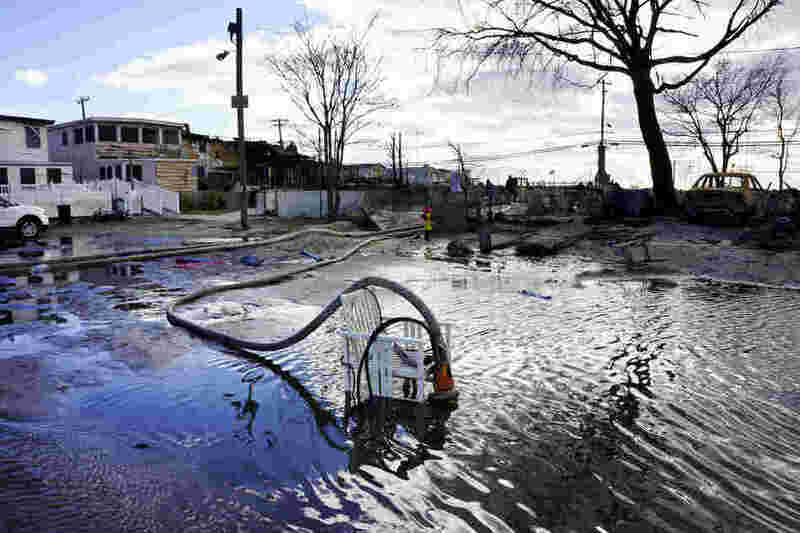 111 homes were lost in this small seaside community, as fires raged in the 50 mile an hour winds if Superstorm Sandy. Fire Fighters are now part of a massive de-watering effort in Breezy Point. "We're trying to put the water back where it came from," says Chief Pfifer. The 16-square block beachfront fire left nothing but foundations, chimneys and ash. Everyone in the community has been evacuated and no deaths where reported as a result of the Breezy Point fire. Summer cars and barbecues were among the few recognizable signs of life after the fire. 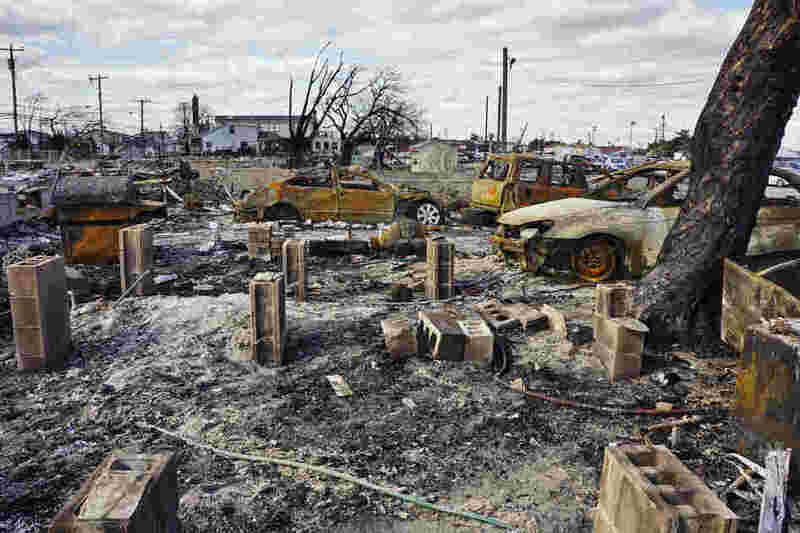 Breezy Point's residents say they will rebuild. 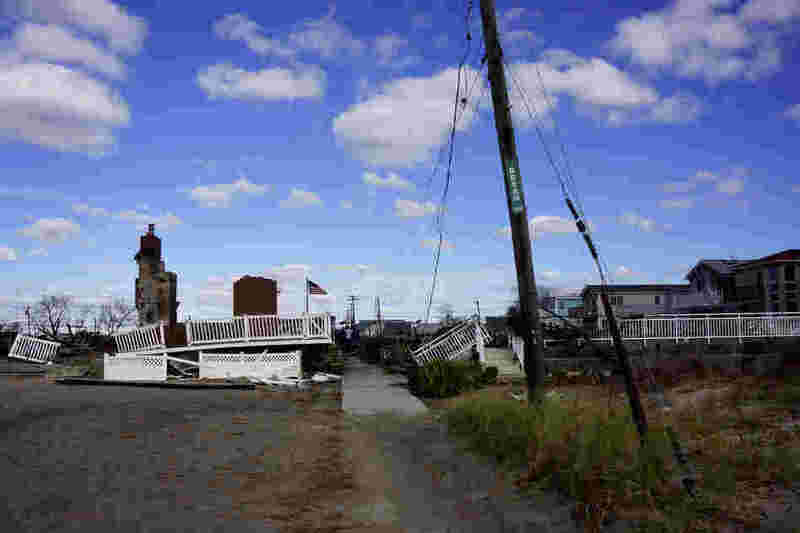 Anyone who traveled to Breezy Point, Queens in New York City in the aftermath of Hurricane Sandy, even as recently as a few of days ago, would have needed an SUV â" its main thoroughfare was under three feet of water. Today, you can see pavement. It sounds like a small victory, but this beachfront, blue-collar town is willing to accept progress in increments. "You have no idea how much the flooding situation here has improved," says Fire Department of New York chief Joseph Pfeifer as his SUV winds its way into town. The line of cars to get into Breezy Point stretches for miles, all the way back to the highway. "Some of this is people wanting to see their homes and some of this is just people wanting to see if it looks as bad in person as it does on TV." Breezy Point is a place where cops and firemen and nurses buy homes. One side of the peninsula opens out into Jamaica Bay; the other, the Atlantic Ocean. People come here to retire or relax. 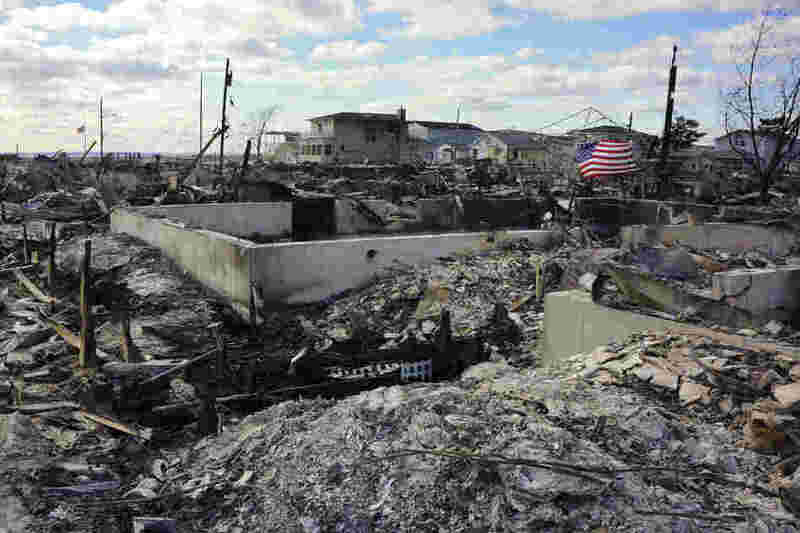 Then, last Monday night, Hurricane Sandy roared into town and Breezy Point became home to a harrowing scene: one of the biggest residential fires New York has ever known. "Flames were shooting 50 feet into the air," said Pfeifer, who was the first chief on the scene. "Radiant heat would light up the next building and then that building would explode in fire." Pfeifer said he had only seen anything like it once or twice before. "It was very hot and very fast moving," he says. "I have seen fire like that moving quickly on 9/11 ... and an industrial fire in Greenpoint ... but I never saw anything of this magnitude in residential buildings." The fire is still under investigation, but Pfeifer said it started in the houses along the ocean side. It may have been an electrical fire; as flood waters roared in, there may have been a spark. What is more certain is that it took firefighters five hours to bring the fire under control and another four after that to put it out. Miraculously no one â" firefighter or resident â" was killed. "I had three towers up," Pfeifer says of the high pressure hoses that are used to dowse fires, "And it wasn't doing anything. We had hurricane-force winds, no water pressure ... I had guys who were sending up oxygen tanks so they could keep fighting the fire." Now the six square blocks where the one- and two-story houses once stood look like a snapshot from London after the Blitz. There is an occasional chimney and everything else is flat. The residents who do come to survey the damage pull small children's wagons behind them as they walk to where their houses once stood. Invariably, the wagons roll out empty. There is nothing left to save. Pfiefer is the New York City Fire Department's Chief of Counterterrorism and Emergency Preparedness. He has been in Breezy Point nearly every day since the fire, trying to help the community get back on its feet. To understand how Hurricane Sandy has effected Joe Pfeifer, you have to know a little bit about the chief's history. He fought fires in Breezy Point as a volunteer when he was just 18 years old. Now, the citywide command chief has a weekend house here; so does his son and so do his parents. People here know Joe Pfeifer. One resident asks him about the bandage on his face. "Ah, it was an ember from Monday night," he says, changing the subject. It's actually a second-degree burn, but he doesn't tell anyone that. He was one of a handful of firefighters who suffered injuries fighting this fire during the hurricane. Almost a week later, Pfeifer is still gaming out the blaze. "If I didn't stop it on this cornerâ"," he begins telling Bill Radtke and his daughter Deidre before Radtke jumps in. "You would have lost all of them," Radtke says. Pfeifer considers that. "I would have lost your house," he says. "Your son's place too," Radtke suggests. "Yeah, my son's place too," Pfeifer says. As the pair walk away, Pfiefer looks over the field of ash. "And now the question is how does the community recover?" One of the answers can be found in the small shopping mall offices where the Breezy Point Cooperative is trying to organize the local relief effort. They are working with FEMA, city offices, and the FDNY to help get Breezy Point back to normal. Pfeifer is an evangelist about preparedness and he's convinced the plans that have been made since Sept. 11 and in the wake of last year's Hurricane Irene have made communities more resilient. Arty Lighthall, the general manager of the neighborhood cooperative, sits at the head of a table and runs through an alphabet soup of local and federal agencies. The group meets every day, sets a 24-hour goal and then checks back to see if they have achieved it. Lighthall, who seems pleased with their progress, he runs through the list of accomplishments while Pfeifer and almost a dozen other people follow along. A New York City Office of Emergency Management official is there and well as a Health and Human Services. Another volunteer tapes a map of the Breezy Point area on the wall and shows how he intends to get the hydrant system up and running. A major concern now, Pfeifer says, is that as people return to their homes other fires could break out. People realize they don't have flood insurance, but they do have homeowners insurance, and candles "accidentally" get knocked over and houses go up in flames. It happened in New Orleans after Katrina. Concerns about arson aside, Pfeifer says this kind of community coordination is what is supposed to happen after a disaster. City officials are now helping local leaders get to the next phase: recovery. The FDNY is no longer just in the business of putting out fires, Pfeifer says. They are cutting downed trees and de-watering flood zones, and helping local communities learn how to fend for themselves. FDNY water pumps and oversized hoses are all over Breezy Point, putting the water back into the sea. Since Sept. 11, the new way of thinking has been letting communities take the lead in recovery. The preparedness drills and city management teams aren't designed to have the city take over. Instead, it is about giving communities the tools they need to cope. The Sept. 11 attacks were concentrated on a 16-acre area. The damage from Hurricane Sandy is much bigger and diffuse. "Because we have such a large location and many locations around the city have to be done at the same time, it is really going to depend on the communities," Pfeifer says. "So we're trying to show them how to run this themselves. And it is one thing to do it right after a disaster strikes ... it is another to have them do it long term. And this is going to go on for quite a long time." Theresa Flannagan used to run bake sales, exercise classes and Halloween parties in Breezy Point. She says people saw the storm coming, but no one imagined it would do the damage that it did. "We thought it would be like Hurricane Irene," Flannagan says. "The waters from that came up the street, went back down the street, and hardly left a puddle." Hurricane Sandy put five feet water in her house and she tears up just thinking about it. She says everyone is dazed by the magnitude of it all. And that feeling, she says, is familiar. "It reminds me of right after 9/11, the way everybody looks, the fear in their eyes... scary," she says. Pfeifer agrees there is an element of that going on. He should know, he was the first fire chief to arrive at the World Trade Center on Sept. 11.